Do You Really Need Air Duct Cleaning? It could be! If you’re moving into a new home or thinking of upgrading your HVAC system, ductless heating is a great option, but how do you know if this type of system is right for you? If you’re unsure about how a ductless mini split system would work for you Eugene, OR home then keep reading below. Remember that your HVAC system is only as good as your system and installation services, so you should always schedule your services with the professionals on our team. If you’d like great ductless services here in Oregon, then contact our team today to schedule an appointment. Most heating and cooling systems here in Oregon are ducted systems but a ductless system is still a great option here in our climate. Forgoing a furnace might be a great choice for your home. If you’re interested in this alternative system, then the first step is understanding how ductless mini splits work. You’re probably familiar with a standard furnace. Furnaces are the most common heating system across the country. They’re a forced air system that uses the ductwork in your home to distribute air to different rooms. A ductless mini split is a heat pump system that doesn’t rely on ducts at all. A ductless system uses individual air handlers installed through the home rather than using a centralized furnace or air conditioning unit. In cold weather, a ductless mini-split uses heat pump technology to reverse the direction of its typical refrigerant cycle, remove heat from the air outside, compress the warm refrigerant, and then use the heat to warm up the interior of your home. Ductless mini splits have a myriad of benefits for your home. Easy Installation: ductless mini splits are a lot easier to install than other systems because of their flexibility. 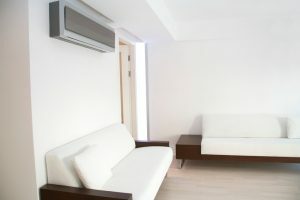 The connection between the outdoor and indoor units requires a very small hole and most manufacturers supply a variety of different lengths so that your outdoor unit can be up to 50 feet away. Ductless mini split installations are fast and quick. Less Energy Loss: Since there are no ducts in this system, you have a lot less energy loss. While ductwork is an efficient way to get your conditioned air to your home, neglected ductwork builds up debris, dust, contaminants, and even leaks or cracks that contribute to energy loss. Duct losses account for more than 30% of the energy loss in your home. If this is a major concern of yours, a ductless system is an excellent choice. Flexibility: It’s likely that your home has different zoning needs in different areas. Your upstairs space might be perpetually stuffy while your downstairs space is cold or the back of your home that’s shrouded from sunlight might need some extra heating power. A ductless mini split allows you to customize heating power in certain areas because each air handler has its own thermostat. If you’d like to install a ductless mini split system in your home, contact our team here at Comfort Flow Heating today to schedule an appointment.